Sooooo comforting. That’s what this soup is this time of year. If you’ve seen the Batch Cooked Ground Beef, this is recipe 4 of 5 that I created to go with it. Basically, cook up grass-fed ground beef seasoned with an onion, and you have 5 healthy recipes to go with it – like Protein Cabbage Wraps, Cheesy Spaghetti Squash, or Stroganoff Stuffed Portobellos. When I asked my followers (friends, really!) on Facebook what their health goals were, the highest percentage of them said, “eat more vegetables!” This is my way of supporting them….deliciously. What is your health goal this year? Please leave me a comment below! I tried to keep it really easy without sacrificing any flavor. If you have already prepped a protein, you shouldn’t have to use a ton of ingredients nor time throughout the week. Plus, in the colder months (at least where I’m at), being able to cook *healthy* meals with what’s in the pantry and refrigerator is a must! Here’s our star recipe for today…. We usually have these on hand – organic baby carrots. Slice them roughly – no perfection required. The only thing I don’t want you to do is cut a finger! ….if you haven’t done that, consider yourself a success. 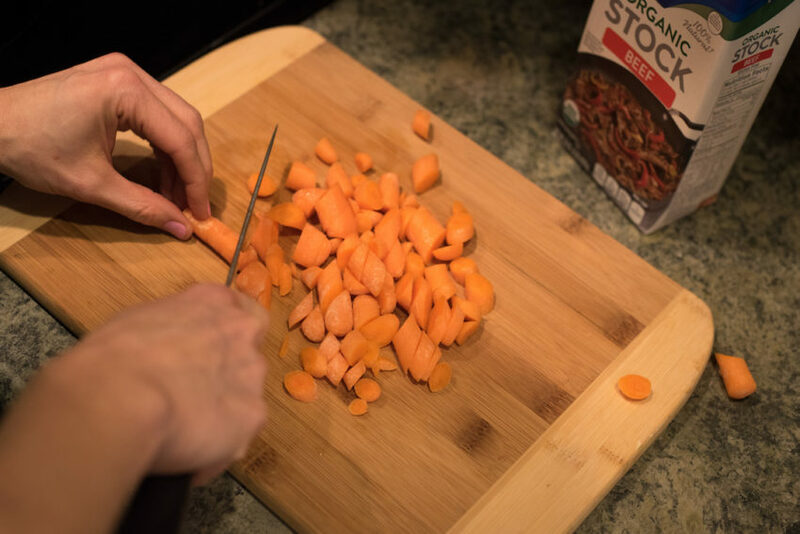 These days, doing the chopping ourselves makes us a kitchen success! Add diced tomatoes with basil, garlic, and oregano. The addition of all those Italian ingredients with the canned tomatoes saves a ton of time! 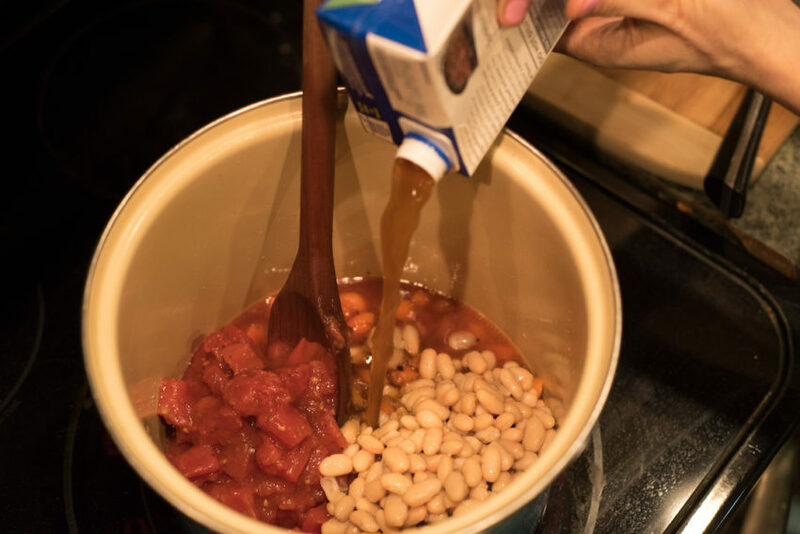 Then add cannellini beans – a rich, flavorful, creamy bean – and beef broth. 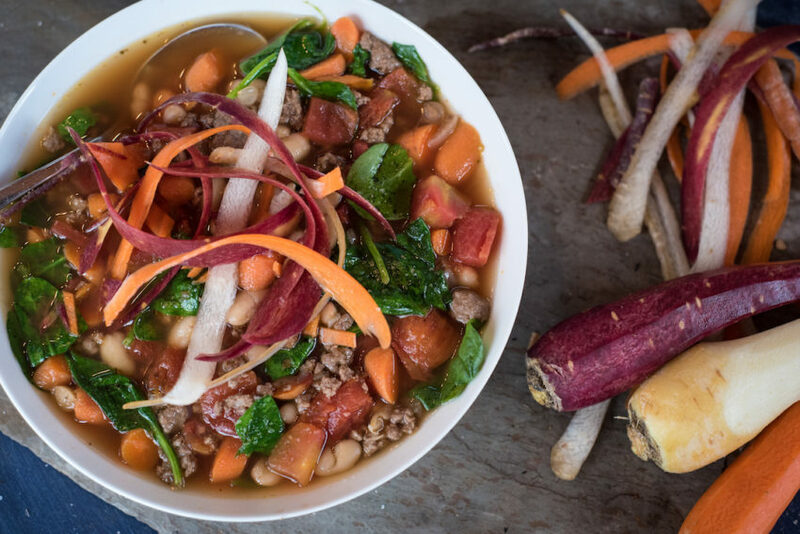 And dive in to a warm, comforting bowl of hearty beef soup. I usually top my soups with something – but this soup needed nothing added. It is absolutely wonderful. 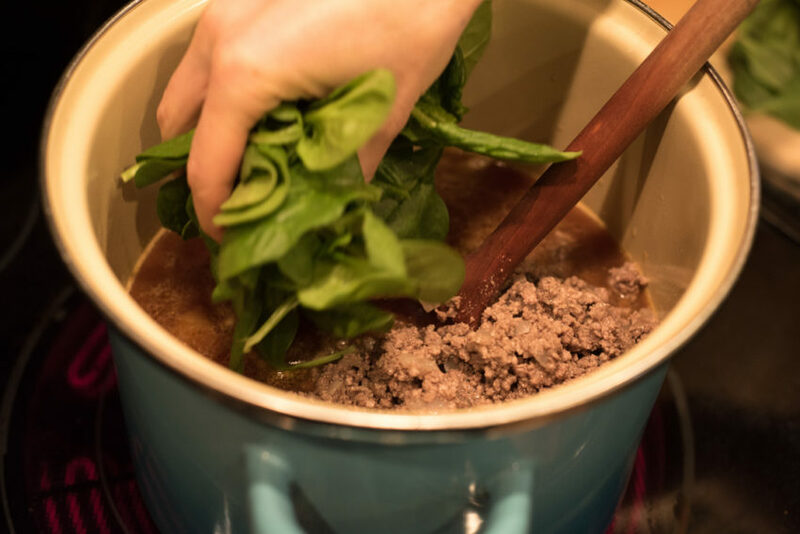 My kids always ask for seconds, which tells me even though I call this “Weight Loss Italian Beef Soup”, that if kids enjoy it, it’s a winner all the way around. I hope you like it too! I created this recipe for Albertsons Safeway. Message me below with your thoughts! My weight-loss cooking class raved about this one! 1. Spray a 5 quart pan with nonstick cooking spray over medium high heat. Add carrots and sauté 2-3 minutes. Add tomatoes, beans and beef broth. Bring to a simmer, then add beef, spinach, and salt. 2. Continue simmering 12-14 minutes. It’s ready to serve! Soup can be cooled down and frozen for future meals, too. I’m going to do this next week. Sounds so good. That is awesome Pat! Please let me know how it turns out and what you think. Loved this soup, it was so filling, flavorful and delicious!! I didn’t add the beef stock, instead added 3 cans of tomatoes instead. (Didn’t have beef stock available). Top with Parmesan cheese & red pepper flakes! I didn’t have an avacado on hand either. Thank you for these recipes! This is great, Susan!!!! I’m so glad you liked it. And what a wonderful idea to sub out and use 3 cans of tomatoes! Made this soup for dinner tonight-it was delicious! I added a green pepper for a little more flavor. Will definitely make again with the cooler weather coming! Thanks for another fabulous recipe Annessa! I’m thrilled that you liked it, Laura!!!! Thank you for this comment – and I love the addition idea of green pepper – good call! 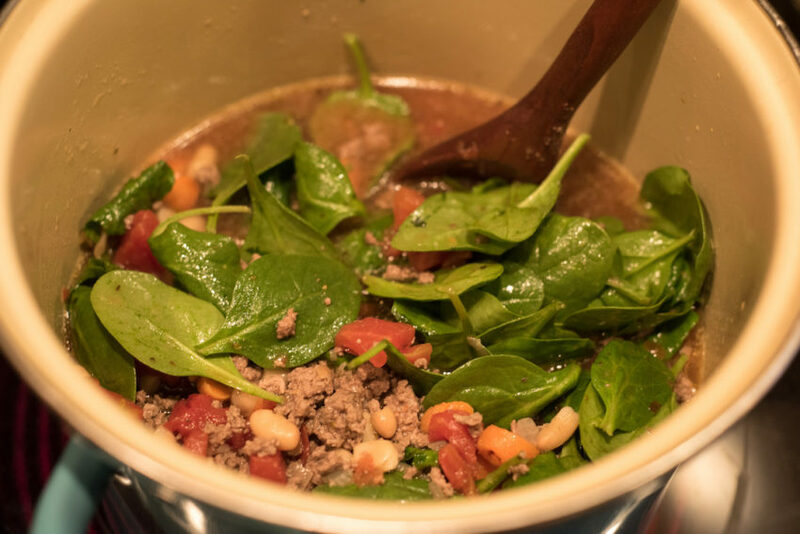 Made this soup the other night and oh…my was it delicious!!! Thank you so much for all your yummy recipes that my family and I enjoy! 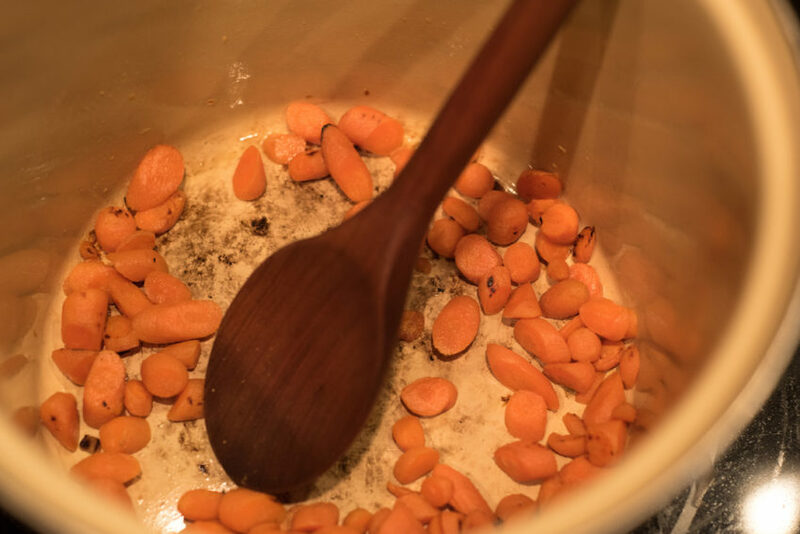 This soup is delicious and so easy to prepared. Highly recommend this recipe. I’ve made this several times- so good! Quick, easy, delicious, nutritious! With regards to counting calories and getting fit, a great many people are searching for prompt outcomes while wandering into a losing weight and get-fit program. Following quite a while of devotion to weight reduction and wellness, I know methods for kicking off your digestion so you can get in shape speedier. In any case, it’s not quick and it requires some commitment and diligent work for your benefit.